Citizens United activists. Voter’s rights activists. Women’s rights activists. What do these three groups have in common? Corporate Personhood. Thanks to a couple of rulings by the Supreme Court of the United States (SCOTUS). What does corporate personhood have to do with voting and voter rights? In January of 2010 the Supreme Court ruled on Citizens United vs. FEC in favor of Citizens United with a 5-4 split. This gave corporations the same free speech rights as living, breathing human beings. It allows corporations to contribute unlimited and undisclosed amounts of money to influence the outcomes of elections. We have seen the effects of this countless times. One small example is how the Koch brothers contributed outrageous amounts of money to ensure that their favorite candidates get elected. The Citizens United decision has allowed corporations to have a far greater influence in our elections than individual human beings. Many believe that this is turning our Democracy into a Plutocracy or an Oligarchy. Move to Amend and Free Speech for People have been determined and active leaders in the effort of proposing a Constitutional Amendment addressing corporate personhood. S.J.Res. 18, introduced in the Senate by Senator Jon Tester (D-MT), and the identical H.J.Res. 21, by Rep. Jim McGovern (D-MA), also known as the People’s Rights Amendment, make it clear that corporations do not have constitutional rights, as if they were people. H.J.Res. 21 has bi-partisan support in the House from Rep. Walter Jones (R-NC), along with many other co-sponsors. The text of these bills is below. There are some that do not feel that S.J.Res. 19 and H.J.Res 20 go far enough and prefer H.J.R. 29. "Congress should take its lead from the people, who have already made it very clear in both red and blue states that a constitutional amendment is needed, and that campaign finance reform is only scratching the surface. Such an amendment has already been introduced in Congress by Representative Rick Nolan (DFL-Minn.) in February of 2013. Udall and his co-sponsors should take their cues from HJR-29, or the “We the People Amendment,” if they’re serious about representing the people’s interests. Anything else is an election-year bone not to be taken seriously." What does corporate personhood have to do with women’s issues? On June 30th, 2014 in Burwell v. Hobby Lobby Stores, five male Justices ruled in favor of Hobby Lobby in yet another 5-4 split. Family owned businesses, even if they are huge corporations, are now allowed to pick and choose which birth control options their female employees will have access to via their company health insurance plans. 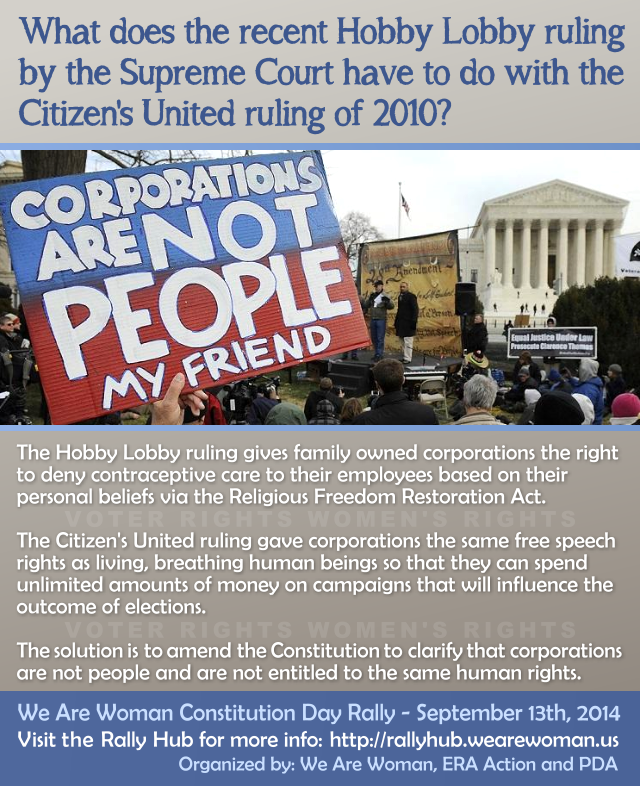 This is an issue of corporate personhood because SCOTUS bestowed upon corporations the same religious liberties that have always been reserved for people. Under the Religious Freedom Restoration Act, corporations now have the religious right to deny contraceptive care to their employees. Corporations do not pray or sit in pews so why should they have freedom of religion rights? Further reading: Will Hobby Lobby open the religious exemption floodgates? 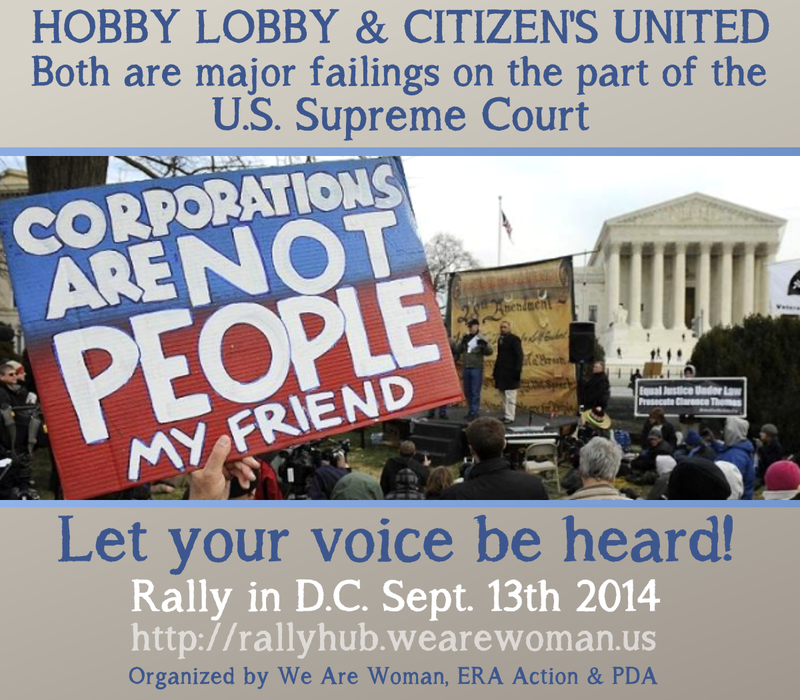 In the Hobby Lobby case the Supreme Court gave corporations freedom of religion rights. In the Citizens United case they gave corporations freedom of speech rights. The reality is that corporations are NOT individual human beings. They don’t breath, reproduce or vote. In fact, businesses generally incorporate in order to protect the personal assets of their owners and shareholders. The corporate veil shields the individuals who form the corporation from any potential financially liabilities incurred by the nonliving corporation. How are corporations not people when it comes to liability, but they suddenly become people when it has to do with freedom of religion rights and free speech rights? Both the 1st Amendment and The Religious Freedom Restoration Act were meant to protect individual people, not incorporated businesses. One would expect the five men on the court to understand that they have created an oxymoron.